The process for slate & flagstone cleaning are the same. This two man process requires the use of a 17″ floor machine, also known as a buffer, as well as the use of our rinse extraction machine. Sometimes, we run across a floor that has previously been coated with a topical gloss type sealer. In these instances we have to strip the floor of that coating before we can continue. 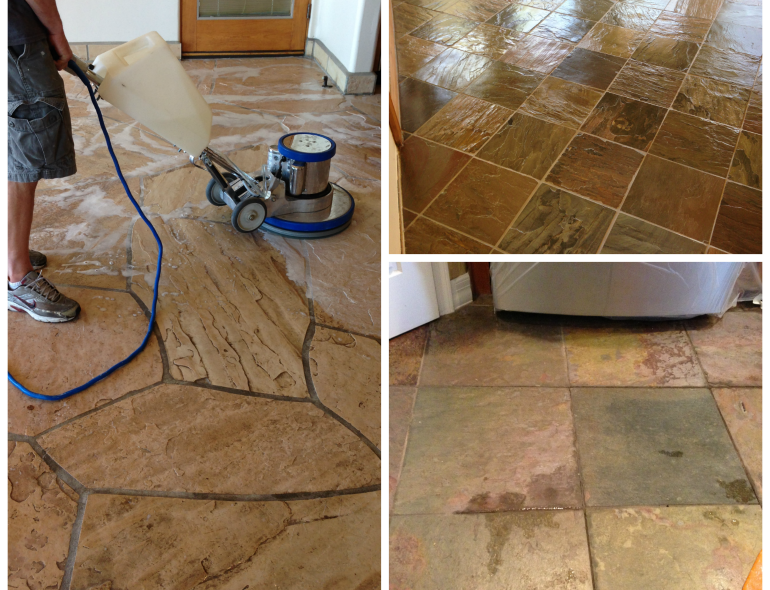 The slate & flagstone are then thoroughly cleaned and a penetrating sealer of your choice is applied to the clean floor. Please see our grout sealing page for our different types of sealers offered. If you are unsure if you have a coating or a sealer on your slate or flagstone floor give us a call or fill out our Contact Form. We would be glad to assist you!